I spend a lot of time analyzing what I eat. How many calories? What are the macros? How can I get more carbs that are ‘healthy’ and not processed? I also spend a lot of time skipping over the ‘extras.’ We don’t live far from a Dairy Queen and when they are open for the season our family walks there at least once a week…maybe once a year I actually order something. I do my best to make substitutions and cut portions. If I can order a salad instead of fries I usually do, and if my husband is up for splitting a meal so am I. Can it be argued that these behaviors are obsessive? Maybe…but for me they opened my eyes. I feel empowered and educated about my choices and can also see the reflection of the consequences of them – both positive and negative. Recently my mom baked these chocolate chip cookies that are out of this world. They are no ordinary cookie…they take a lot of time to prep and as someone who doesn’t bake I think they are worth every single second of that prep time. Then I took the time to enter the cookie into MyFitnessPal. Surely I have no way to know if the nutritional information is exact but it’s close enough…135 calories. Would one cookie? One 135 calorie cookie really make or break my day? Why would I deny myself something I enjoy so much over and over? How did I define healthy? If 135 calories is truly the breaking point in my day, I have other things to consider. I have either moved too little or consumed too much of other things. One cookies is not the determining factor of my day. It’s easy for me to pass over Dairy Queen. We go once a week because I love the experience with my family. I’m honestly not tempted by the ice cream because it’s not something I crave, but those cookies on the other hand, I do. So instead of saying no to everything, it was more important for me to evaluate my choices as a whole. In my quest to define my life through healthy choices I was making unhealthy ones. Instead of facing my choices head on by having the appropriate portion size, I was avoiding it all together so I wouldn’t be tempted to have 5 instead of just 1. I think as we strive for health we have to acknowledge that we have choices. Whether it’s what we eat or how much we exercise, we have to be empowered by our choices. Because when we treat food or working out like the enemy – something we can’t have, or something we have to do – we jeopardize our perception of success. Now clearly some foods (like my mom’s cookies and pepperoni pizza) fall into both 1 and 3 so I treat them accordingly. And as for category #2 – I’m no longer going to force myself to eat something because it’s healthy. There are always alternatives! It’s been a long time since I’ve seen exercise as ‘something I have to do.’ I truly enjoy it. Exercise helps me manage stress, it makes me feel strong and it’s how I know that one cookie isn’t going to make or break my day. But for those of you that dread exercise, my encouragement to you is to find an activity you enjoy, find a gym that you can make friends at, and find your inner strength. As for me…I’m off to enjoy a cookie. How do you define your fitness progress? My daughter ran in her first track meet yesterday. She was entered into the mile and ran against boys and girls, some who were a school year older than her. Unfortunately, I missed the race but my husband was there and told me how upset she was at the end of the race with her performance. She’s extremely competitive and was down on herself for not finishing better. When I got home I hugged her, complimented her efforts and told her to be proud of her performance. She ran a 6:56 – something I have never accomplished myself. I couldn’t wait to show her this moment. In just two years she has improved her time by 1:14! This is after a whole winter of basically not running at all and her first race of the season. For those of you who don’t run, one minute and fourteen seconds might not seem like much, but any improvement on a previous time is a huge win for any runner. I wanted to share this story because all too often we are disappointed with where we are but we don’t see how far we’ve come. It’s not always about the number on the scale. But more importantly, the healthy choices we make and the growth we experience in the gym. Find a way to make your progress measurable. Again, this doesn’t necessarily have to be tied to a scale or physical measurements. Maybe you are someone who has gone from never working out to going to the gym two days a week, or maybe you have progressed from 5lb bicep curls to 15lbs! Maybe you never used to eat breakfast but now can’t imagine starting your day without a healthy meal, or maybe your liquid intake used to be primarily diet soda and now you drink half your body weight in water every day. My point is, not matter how small the measure of progress seems, it’s an improvement. Be encouraged by every step you take towards a healthier you. About 6 years ago I made the decision to become a fitness professional. I’ve taken some detours throughout that time but my heart always led me back to helping others obtain a healthier lifestyle. Between personal training and group fitness I have worked with a wide variety of people: young and free and those more wise from life experience, athletes and those dealing with injury and pain, dedicated and those who let excuses get in the way, confident and those who struggle to take a compliment, strong and those who only feel weakness…and any combination of these. I’ve never had someone come to me who didn’t have the foundational knowledge that what they were eating (or not eating) and how much they were moving (or not moving) was the reason they were in their current state. As a trainer I could advise them in general about nutritional choices and I could certainly give them an unforgettable workout, but I always felt like I didn’t have enough time to truly connect with them about the things holding them back from achieving a healthier lifestyle. I needed to do some serious work on me to be able to truly connect with others. I lacked the foundational knowledge to help someone else dig below the surface excuses and obstacles standing in their way. I felt my true concerns for my clients were inauthentic while telling them to do another 15 burpees. I don’t know a single person that hasn’t used ‘not enough time’ as an excuse. So I made up my mind to find the time to work on me, to educate myself, and to make time for others. Not that long ago I was constantly critical of my physical appearance, my parenting skills, and my ability to balance work and home and being successful at both, to name a few. And to some degree I still struggle with these things and many more. Part of what helped me be so successful in working on myself was seeking information on personal growth. I read a few great books and I studied to become an ACE certified Health Coach. I learned about different personality types and how to best connect with them, I developed strategies to help people uncover the unsaid things standing in their way and discovered that my personal growth was a great foundation for helping others. Since becoming certified I have worked with a few different clients ‘beyond’ the gym walls. We talk about their struggles, we celebrate their successes, we dissect their obstacles and we take great joy in dreaming about the future. Are you someone who knows exactly what you need to do but still feel like there are things standing in your way? Do you want to dig deeper to set some goals for achieving a healthier lifestyle? Do you want strategies for overcoming perceived failures and excuses? Are you in need of an accountability partner to stay true to your vision? Let’s talk. My journey may be different, but I can empathize with being on one and I can help you better navigate your own journey. Give me a call at 574-387-1344 or email me at personaltrainingbyjenn@gmail.com to schedule your first Health Coach appointment. This blog post has been rolling over in my head and my heart for a few weeks now. It stems from a song that I’ve listened to on repeat a few times. And each time I hear ‘The Middle” by Jimmy Eat World, I’m struck by how important the message is. It’s simple…but it’s relevant, and it’s something we all need to take in. And don’t you worry what they tell themselves when you’re away. Little girl, you’re in the middle of the ride. Hey, you know they’re all the same. You know you’re doing better on your own (on your own), so don’t buy in. Live right now, yeah, just be yourself. It doesn’t matter if it’s good enough (good enough) for someone else. Just do your best (just do your best), do everything you can (do everything you can). Then last weekend I got some of the worst news I could ever think possible. News that deeply saddened me, made me angry, made me numb, and made me want to pull any person that is dear to me closer. On Monday night I was teaching the class and ‘The Middle’ came on, bringing tears to my eyes as my heart filled with sadness, anger and love all at the same time. You see in life we are always going to be in the middle of something. Maybe it’s the middle of working towards a goal. For me, I’m two half marathons away from my goal. My legs are tired, I’m worn out and though the finish is within sights it’s taking everything I have to put on my running shoes and do another 13.1. Maybe it’s that sort of middle where you just feel stuck. Even though you are working hard and doing all the right things, nothing is changing. It’s like running into the wind – the effort is there but you don’t feel like there’s any forward progress. Maybe it’s a middle that’s so low you can’t see the beginning or the end. I’ve been there. Overanalyzed decisions that got me to the terrible middle and left desperate for a solution that would help me climb out of that place. The thing is no matter what ‘middle’ you’re in right now I guarantee there is someone else in your life in that same middle. Don’t take on your ‘middle’ alone. We’re far more quick to write ourselves off than others will. Stop being your worst enemy. Talk about your struggles with those you trust and accept the encouragement they will give you. Get out of your head. We all have negative self talk – silence it by soliciting positivity from those who love you. Try your best. Doing your best doesn’t mean being perfect, it means staring down the challenge and knowing that in the end you couldn’t have given any more. Don’t sit on the sidelines for fear of failing, the biggest failures in life are when you don’t even try. Try everything you can. You never know what you’re capable of until you try. Take risks. Will you fall down? Sure! Will you be disappointed sometimes or heartbroken? Absolutely. But get out there and live life and take those chances, because that is exactly what is going to sometimes pull you out of the middle. Don’t worry about the opinions of others. Be free to live a life that is true to yourself. We only get to do this once, why waste your time consumed by what others say? Be the best you possible. Here’s what I tell my Schindlings all the time, ‘You be you. Worry about yourself and just be YOU.’ We are all uniquely and wonderfully made, be concerned with making yourself the best version of you and don’t bother to compare yourself to anyone else. Remember, we’re all in the middle and it’s gonna be all right. Some stages of being in the middle might seem like the end of the world but it’s not. Chin up, cry when you need to, be angry when you have to, but don’t allow yourself to give up. If you need help ask for it, if you need a hug give one, if you feel alone know that you aren’t. No matter your ‘middle’ know you are loved and a true blessing to more people than you can possibly know. To keep yourself motivated, your gym should feel like a family. Earlier this year I decided to put all my eggs in one basket. I know everyone says to not a good idea but in this case it just made sense. I was teaching and training at 3 different gyms, plus running a small studio space out of my basement for personal training. If someone needed a sub I was the first to respond. While I was doing what I loved, I was starting to dread going to certain gyms and teaching certain classes. So I did some soul searching and realized, there was one place (aside from my home studio) that I really felt like I belonged…CustomFit. 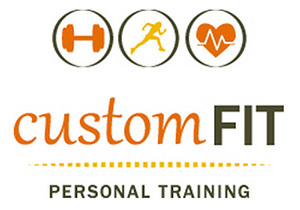 My relationship with CustomFit started when I first moved to Lombard. A group of my friends and I would drop off our kiddos for school and head to classes at CustomFit with Julianne. Having taught and trained for a few years prior to the move I was so impressed with the classes and Julianne’s ability to increase challenge and/or modify when necessary. I looked forward to every class because I knew I would be pushed but I also looked forward to them because it was an hour that I got to spend with my friends. Once the Schindlings were settled and I felt like we had our ground in Lombard I decided to get back into teaching and training. I was so eager and excited about getting back to what I loved that I leaped at any chance to pick up a class or sub. I was teaching morning, noon and night with training clients in between. I was exhausted. I was losing my drive and my passion. How does that happen when you’re doing what you love?! And then I realized it was about the culture. Whether it’s at work or in a social setting you know that ‘person’ who brings the negative energy. Or that ‘person’ you just can’t connect with no matter how hard you try. Or that ‘person’ that makes you feel bad about yourself. I took a deep breath and looked at my options and realized the place that always brought me positive energy, the pace that I always felt connected, and the place that made me feel the most accepted and confident was CustomFit. It might sound cliche, but we aren’t a typical gym…and I can’t think of a better way to explain that than by using the words of our own members. I love how the trainers are willing to help modify the exercises to best suit each person’s abilities. Kate W.
Julianne and I both take the time to get to know our members. We know if you have shoulder issues, or if you need low impact options for cardio. Fitness is not a one-size fits all solution and as a member of CustomFit we recognize and accommodate individual needs. My experience is that the trainers are really really knowledgeable and the members are all really supportive. Everyone pushes me to work harder without feeling bad about myself. It’s a really positive place. – Gabby L.
Nothing makes me more happy during a class than seeing our members encourage each other – and it happens often! While everyone has their own goals, they take the time to empower others to reach theirs. Custom Fit is accepting and accommodates to those who are just starting out! Bre M.
Whether you are just dipping your toe in the water to test out being active or have been working out for years, we are there for you. EVERYTHING can be modified to be more challenging or more basic. There is truly something for everyone. Judgement free and compassionate coaching. Mary S.
We have an unspoken ‘no judgement’ rule. It’s unspoken because it’s never been an issue. We accept each other. We encourage each other. We engage in the journey of fitness with each other. And most of all we celebrate our wins with each other. Fun environment that is a true family with members and trainers. The trainers help you set goals and care about you achieving them!! Caisey S.
Working out is hard – you’re gonna sweat and you’re gonna do things that challenge you physically and mentally, so why not have some fun while doing it? We are serious about obtaining our goals but we have some serious laughs along the way. Oh, and social events every month! From cookouts to pub crawls to ball games to cooking parties – we connect outside of the gym as well. Tough workouts with great people. It’s a family. Don S.
I’ll admit – this one was written by my husband. So yes, it’s TRULY family! But I wanted to include it because for a guy who hates cardio, he comes at least one time a week to my kickboxing class and every week he is pushed to new limits. So if you’re wondering, yes, guys come to our classes too! Positive, encouraging environment. Colleen F.
The member that wrote this worked out with us through her pregnancy (as have a few others). Everyone is at a different stage in their journey – whether you are trying fitness for the first time, or growing your family, or needed to shed some pounds, or wanting to build muscle, or looking to work off the stress from the day, or just needing an hour to yourself – you will be surrounded by other people who have walked or are walking in your shoes and are excited to be on the journey with you. Accepting of all ages, schedule is accommodating to city commuters….before I moved. Julia C.
We have both morning and evening classes to accommodate your busy schedules! Some of our members can only do early morning, some hit our classes just off the train, while others come after drop off. Whatever your schedule, I’m positive we have a class that will meet your needs. Make the time to join us. There are countless of other reasons that I want you to come give CustomFit a try but I’ll leave you with this last one…for the month of September we are offering UNLIMITED classes for 50% off and we’ll throw in all of those other benefits for FREE. This morning I completed a tough workout with a friend. The workout included cardio, strength and abs. We did a variety of lunges and squats, mountain climbers paired with push-ups, side plank crunches and stability challenges. On a scale of 1 to 10 my level of effort during that workout ranged between a 7 – 9. I was spent. Here’s the report from my Polar heart rate monitor. As you can see by the report, I burned 447 calories and kept a relatively high intensity for the entire workout. When I got home I was ready to refuel. After entering my food into MyFitnessPal I got to thinking about a ‘snack’ I had yesterday, as well as a couple meals that I have eaten recently that are about the equivalent of what I burned in that workout. Let’s take a closer look at my snack and meals. I know the ‘details’ of calories can be boring and overwhelming. I hope that by sharing what I learned by the details from each, you will be encouraged to take a closer look at your choices as well. The snack, while healthy, was high in calories, carbs and sugar. However, because I was using it as fuel for an upcoming workout, it was timed perfectly. Looking back, I could definitely have dropped the banana and reduced the amount of milk. Remember, this snack was ‘beefed up’ because I was using it to fuel me for teaching an hour long cardio class and then instructing another hour long BootCamp class. Snacks should generally be around 100 calories. Now let’s look at a couple meals I have consumed lately. The first meal has a decent amount of protein but is a little high in fat. One easy improvement I can make to this meal is to use a better quality fat such as Greek yogurt or avocado to assemble the egg salad. While I always have hard boiled eggs in my fridge as an easy protein, I failed to plan for the healthy fats this week. One of my go to meals when I don’t have much time. I can’t emphasize enough how important planning is to a healthy lifestyle. Whether it’s your food choices or getting in your workout, you have to plan to make it work. Finally, here’s a post-workout meal I ate the other night. I had just finished teaching PiYo and INSANITY, followed by an hour of upper body strength training. This meal had the greatest amount of protein which I needed to refuel and repair after 3 hours of intensive exercise. To be honest, I actually couldn’t even finish this meal. My dog got to enjoy some of the remaining tuna and I saved the broccoli for later this week. Protein is so important to the recovery process after exercise and in general most people don’t consume enough quality protein. I find that tuna is another great go-to protein source for me with 17 grams in just one single serving package. So what does this all really mean? The numbers are boring, right? I think they are too. But they are a key component to weight loss, building lean muscle and workout recovery. KNOW your portion sizes! I intentionally had 2 servings of the cereal because 3/4 of a cup for a pre-workout snack just isn’t enough. However, all to often we are doubling and even tripling portions without being aware. PLAN and PREPARE! I was without healthy fat ‘fillers’ this week for both my hard boiled eggs and tuna. Take the time to plan your meals, have easy snacks on hand and you will be far more successful in sticking to healthy choices. PROTEIN, PROTEIN, PROTEIN! I know many people struggle with finding quality sources of protein. Boil eggs and have them on hand, cook extra chicken at dinner time that is easy to use for lunches, prepare quinoa and have it in the fridge to add to salads or use as a side, find a powder that you like and make a shake…the thing is there are plenty of ways to consume protein – find what works for you. WATCH your sugar intake! My snack was very high in sugar because of the fruits I added to the cereal. The cereal and milk combined were 20 grams of the 41 grams of sugar. So the fruit was just over half of that. Here is an excellent resource to see which fruits have the least and most amount of sugar. CHOOSE quality calories! The snack and two meals I shared here were filling. Had I chose a soda and chips it might have been the same calories but I wouldn’t have had the same energy and likely would have been hungry shortly afterwards. Eating junk leaves me feeling like garbage, but eating quality foods makes me feel strong. Are you your own worst enemy? I was for a long time and this is how I got over it. I’ve been one of my own worst enemies since I was about 12. Maybe it was a little sooner, maybe it was later…either way it was around that age that I began questioning myself and internalizing others opinions about me, or what I perceived their opinions to be. Was I smart enough? Pretty enough? Thin enough? Successful enough? A good enough mom, wife and friend? I compared myself to others – not in a way that put them down, but in a way that put me down. It seemed everywhere I looked I saw someone doing life better than I was. But lately I’ve stopped looking around and started looking within. My life is about being the best me. Sure other people are more intelligent, but I have the knowledge I need to be a successful trainer. And I’m wise enough to know when I need to learn more or ask for help. I’m certainly not going to win any pageants, but then again that is not the type of beauty I want anyway. I’m a perfect reflection of my parents and to me there is nothing more beautiful than that. I’ve learned to not define myself by the number on the scale but I also had to learn to not define myself by the reflection in the mirror. Sure, there are always going to be areas that I want to work on, but instead of being critical of those areas, I see them as opportunities to either be more accepting of myself or to get stronger. I realize I’m not a household name when it comes to trainers, but over the past 6 years I helped a number of people discover the joys of living a healthier lifestyle. It’s hard to describe the feeling I get I see my client’s getting stronger, or when I get a text from them telling me about running their first 5k or completing a hike that at one time was much more difficult, or best of all, when I see them starting to believe in themselves. And to me, that’s success. Now for the hardest questions – am I a good enough wife, mom and friend? This answer is a little more tricky. Yes I am good enough. But that doesn’t mean I won’t make mistakes and that I won’t need to ask for forgiveness. I’m human, I sin, sometimes my emotions trigger my actions and reactions, I can be selfish, I can make assumptions (wrong assumptions), I can be critical, I sometimes let people down and disappoint them, the list could go on. But instead of focusing on all the ways I ‘fail’, I’m learning to admit them and not hide from them. I’m learning to ask for forgiveness and to forgive myself which is making me a better wife, mom and friend every day. We all have opportunities for growth, to better ourselves intellectually, physically and spiritually. Instead of being critical of who we are or where we are in life, let’s embrace our chances to grow, and recognize the journey that has brought us this far. 1. I assess your current exercise and eating lifestyle. 2. I create goals based on a custom plan that will work for you. 3. I help you follow the plan and keep you accountable. Interested in learning more? Just send me an email and we'll figure out a time. If you sign up for my newsletter you'll receive occasional deals on training sessions, free training tips and a wrap-up of my best posts from Facebook, Twitter and my blog! My Elle Belle placed #13 in her first high school cross country meet. Looking for family-friendly healthy meals?